Russell Brand has really landed himself in it now. 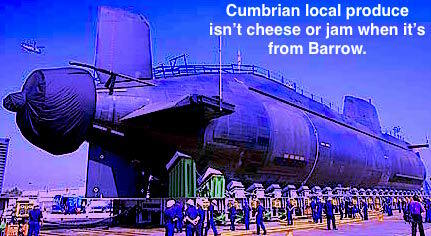 He’s spoken so badly out of turn that he’s been challenged to visit Barrow-in-Furness where they make submarines. It is a boggling concept to think of the showbiz motormouth with the Laaahn-dun accent, being presented to a workforce in the wild industrial north that culturally, could not be further than London, LA or the world of light entertainment. If he took up the challenge, I’d be impressed. It is hard to know the best position to take on Russell Brand. If you follow the news or the media to any degree, ignoring him is simply not an option. Hating him is too simplistic. Thinking he’s the Messiah (or just a very naughty boy) credits him with too much knowledge or influence. Part of me is glad that someone is beefing on unapologetically about some sort of counter to a political system that allows failing bankers to be rewarded with £3m houses in Notting Hill from the taxpayer’s largesse. I hope he knows that things are more complicated though, and that brokers of power do not relinquish that power too easily. I also sigh sometimes when he rabbits on with polysyllabic rants that tend to leave people cold and confused. However his brilliant riposte to a viral video, poking fun at him by people shouting “Parklife” at the end of every blabbering tirade, was inspired. And then sometimes he comes up trumps with a great quote. Nigel Farage as a “poundshop Enoch Powell” is brilliant. For all his infamy for his stance on immigration, Enoch Powell was highly respected by his peers for his intellect and debating skills. Farage is not. On the subject that Powell was notorious for, he’s a bargain basement imitation. So by now oversimplifying the issue of spending on arms versus funding the NHS, Russell Brand has gone and got himself invited right up north and out to the coast. Obviously, if his dream came true, there’d be loads of unemployment overnight in Barrow-in-Furness. I’d like to think that a century from now, there would be no arms industry and a fully funded health system. Stranger things have happened. Thirty years ago, Glastonbury was a load of people lolling about in mud watching bands. It still is, but society changed and Glastonbury became a completely mainstream activity. Attitudes to racism, sexism and homophobia haven’t gone – these things take decades or longer – but have moved from the peripheries. Much of the counter-culture of the 80s is today’s norm. So if Brand is taking the long view, and he met the submarine workers and explained face-to-face what he means, whether or not anyone agrees or is persuaded, he might just flip this waverer his way again. This entry was posted in Popular culture and tagged arms race, Barrow, Barrow-in-Furness, Cumbria, NHS, nuclear submarines, political, Russell Brand, sensationalism.